OP 26 - OPERATION "REALTOR"
"Realtor" was another supply dropping operation over Yugoslavia. The dropping point was between the town of Sinj north of Split and a lake on the east side. The pre-arranged ground signal to be given by the Partisans was a "V" made of small fires. W/O MacIsaac and crew, again flying in their new Wellington "D", LP572, took off from Tortorella at 1406 hours carrying six "D1" type containers and 12 packets of nickels. 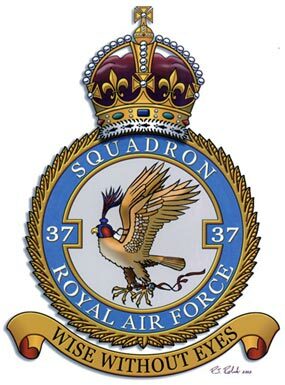 Fifteen Wellingtons of 37 Squadron operated. The weather was good and there was no ground or air opposition encountered en route to and from, or over the drop zone. A few crews saw the ground signal, the remainder aimed on the position of parachutes already dropped. In total the Squadron dropped 90 containers of supplies and 175 packets of leaflets. The containers were reported as well concentrated on the drop point. MacIsaac dropped on parachutes seen in the target area and reported seeing all his parachutes open successfully. Visibility was exceptionally good, and crews observed the ground swarming with the local inhabitants engaged in processions, flag waving, and picking up the containers. All Group aircraft returned safely to base. MacIsaac landed at Tortorella at 1638 hours. Shower Baths - Shower baths have now been completed and are in working order on the Domestic Camp Site, a roster of times for all ranks having been drawn up to avoid overcrowding, etc. Discipline - In order to combat the frequent thefts that have occurred - especially the last case in which the Squadron Stores were broken into and 150 blankets stolen, a roster of Camp guards has been instituted. Medical Research - Research into the whole subject of Infective Hepatitis has been instituted, and statisticians in Public Health have been appointed to collect vital statistics concerning the disease. All personnel were requested to parade and fill in a questionnaire with details of past health, infection and service in the Mediterranean theater.